ORCID number: Suguru Maruyama (0000-0002-9926-7463); Shinji Furuya (0000-0002-6766-3779); Kensuke Shiraishi (0000-0002-8530-362X); Hiroki Shimizu (0000-0001-8553-6864); Hidenori Akaike (0000-0001-9713-7190); Naohiro Hosomura (0000-0003-0483-3635); Yoshihiko Kawaguchi (0000-0001-8788-9524); Hidetake Amemiya (0000-0002-4320-755X); Hiromichi Kawaida (0000-0003-3507-0167); Makoto Sudo (0000-0002-0200-6460); Shingo Inoue (0000-0002-1968-2182); Hiroshi Kono (0000-0001-6843-0814); Daisuke Ichikawa (0000-0003-0093-2206). Gastric cancer (GC) is one of the most common solid tumors and is the third leading cause of cancer-related deaths worldwide[1,2]. Despite improvements in treatment approaches, prognosis of patients with advanced GC remains poor even after curative resection. Among various tumor subtypes, alpha-fetoprotein (AFP)-producing GC (AFPGC) is recognized as one of the most aggressive tumors, with a high propensity for liver metastasis and subsequent poor prognosis compared with other GC subtypes[3-7]. The incidence of AFPGC is low, ranging from 1.3% to 15% of all GCs[8-12]. Therefore, recent comprehensive molecular analyses have not yet referred to this minor subtype. MicroRNAs (miRNAs) are endogenous, small, non-coding, single-stranded RNAs of 20-25 nucleotides that regulate the expression of target genes at post-transcriptional level by binding to complementary sequences. Various miRNAs were shown to play crucial roles in cancer as well as normal cells were reported to act as tumor suppressors or oncogenes in a cell type-dependent manner in various cancers. In addition, certain miRNAs have been used for cancer detection, monitoring of tumor dynamics, and predicting prognosis and chemoresistance[15-20]. In the present study, we examined the miRNAs expression in AFPGC tissue samples using a comprehensive miRNA array-based approach. We also investigated the clinical utility of the identified AFPGC-specific miRNAs in monitoring and prognostic prediction of patients with AFPGC and evaluated their potential as universal biomarker for liver metastases. A total of 492 patients underwent gastrectomy for GC at the University of Yamanashi Hospital between 2012 and 2018. Tumor specimens and resected lymph nodes obtained at the time of surgery were immediately fixed in 10% neutral-buffered formalin and embedded in paraffin after fixation. None of the patients underwent preoperative chemotherapy or radiotherapy. Tissue samples of all five patients with primary AFPGC and those from ten patients with primary non-AFPGC at various stages as controls from the same cohort were selected. The selected AFPGC samples contained all AFPGC patients who were operated in our hospital. Pre-operative plasma samples were also obtained from four AFPGC patients and twenty non-AFPGC patients with GC who underwent surgical resection at the University of Yamanashi Hospital between 2017 and 2018. Control plasma samples were collected from 12 healthy adult volunteers. A total of 5 mL blood samples were collected into ethylenediaminetetraacetic acid-coated tubes and immediately spun at 3000 rpm at 4°C for 10 min to separate serum, which was stored at -80°C for further processing. AFPGC was defined based on a plasma AFP level above 10 ng/mL or positive AFP immunoreactivity in tissue samples. This study was approved by the Ethics Committee of Yamanashi University and performed in accordance with the ethical standards of the Declaration of Helsinki and its amendments. Formalin-fixed, paraffin-embedded tissue samples were cut into 10-µm-thick sections, and total RNA was extracted from tumor and normal gastric mucosa in each patient using RNeasy FFPE kit (Qiagen, Valencia, CA), according to the manufacturer’s protocol. In plasma samples, total RNA was extracted from 100 µL plasma using RNeasy Serum/Plasma kit (Qiagen), according to the manufacturer’s protocol. Microarray analyses of the GC tissue samples were performed using 3D-Gene miRNA oligo chips (Toray Industries, Kamakura, Japan), with 2565 genes mounted onto each DNA chip. Results were compared between the AFP-positive and AFP-negative cells among AFPGC patient samples using macro-dissection. Tissue samples from the three AFPGC patients who underwent curative surgery were mixed equally. RNAs were labeled with the 3D-Gene miRNA labeling kit (Toray Industries). Fluorescent signals were scanned using a 3D-Gene scanner 3000 (Toray Industries) and analyzed with the 3D-Gene Extraction software (Toray Industries). In the current study, expression level of each miRNA was normalized using the median signal intensity of the all genes in each chip, and median signal intensity was adjusted to 25. Levels of miRNAs were quantified by quantitative reverse transcription-polymerase chain reaction (qRT-PCR) using a Human TaqMan MicroRNA Assay kit (Applied Biosystems, Foster City, CA), according to standard procedures. Reverse transcription was conducted with a TaqMan MicroRNA Reverse Transcription kit (Applied Biosystems). Tissue miRNA levels were normalized to the endogenous control RNU6B, and plasma miRNA levels were normalized to a synthetic RNA oligonucleotide, cel-miR-39-3p (Qiagen), by spiking the samples with the oligonucleotide which does not exist in human genome. The following primers were used for the Taqman assay (Thermo Fisher Scientific, CA, United States): human hsa-miR-122-5p (cat #002245), hsa-miR-144-5p (cat #002148), hsa-miR-20a-5p (cat #000580), hsa-miR-20b-5p (cat #001014), hsa-miR-106a-5p (cat #000578), RNU6B (cat #001093), and cel-miR-39-3p (cat #000200). ΔCt values for all miRNAs relative to the control gene RNU6B and cel-miR-39-3p were determined. ΔΔCt values were calculated using mean ΔCt values in non-AFPGC tissue, normal gastric mucosa, or healthy volunteer plasma samples. Plasma miR-122-5p expression was calculated using log10(2-ΔCt). Statistical significance was determined using GraphPad Prism® version 5 (San Diego, CA). Quantitative values were expressed as means ± SD unless noted otherwise. Statistical significance was evaluated using the Student’s t test and one-way analysis of variance for each time point, followed by Tukey’s post hoc test. 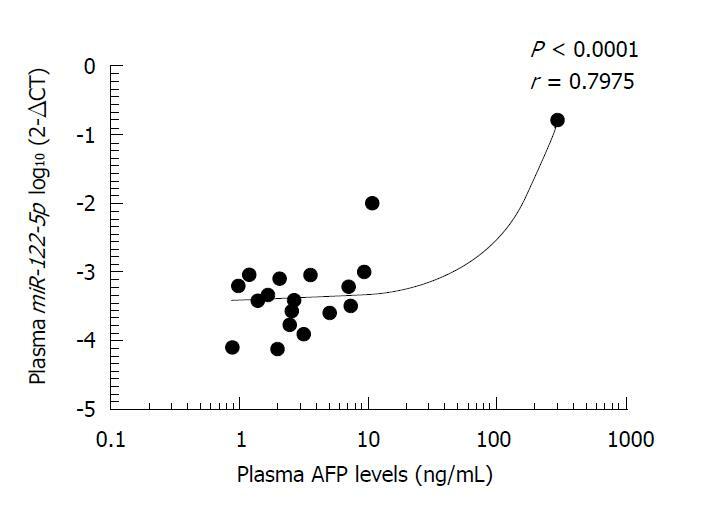 Pearson’s correlation coefficient was determined to assess the correlation between plasma AFP and plasma miR-122-5p levels. P values < 0.05 were considered to indicate statistical significance. We selected miRNA candidates using a miRNA array-based approach. We compared the expression levels of each miRNA between the AFP-positive and AFP-negative cells in AFPGC patients. Of the 2565 candidates analyzed, we selected the following five miRNAs: miR-122-5p, miR-20a-5p, miR-20b-5p, miR-106a-5p, and miR-144-5p. The expression levels of these selected miRNAs were significantly different in AFP-positive cells compared with the AFP-negative cells, and the signal intensity of each miRNA was sufficient (Table 1). Table 1 Summary of five miRNA candidates selected by microarray analysis. Expression level of each miRNA was normalized using the median signal intensity of the all genes in each chip, and median signal intensity was adjusted to 25. AFPGC: Alpha-fetoprotein-producing gastric cancer. We examined the expression levels of the five selected miRNAs in five AFPGC and ten non-AFPGC tissue samples by qRT-PCR to validate their utility (Figure 1). Among these five miRNAs, the expression of miR-122-5p was significantly higher in the AFPGC patients than the non-AFPGC patients. Therefore, we selected miR-122-5p for further analyses in this study. Figure 1 Validation of five microRNAs in non-alpha-fetoprotein producing gastric cancer and alpha-fetoprotein producing gastric cancer tissue samples performed by quantitative reverse transcription-polymerase chain reaction. A: miR-122-5p; B: miR-20a-5p; C: miR-20b-5p; D: miR-106a-5p; E: miR-144-5p. The lines inside the bow plot represent the average size. AFPGC: Alpha-fetoprotein-producing gastric cancer. Next, we investigated the expression levels of miR-122-5p not only in tissue but also in plasma samples. In tissue samples, miR-122-5p expression levels tended to be lower in the non-AFPGC tissue samples than in the normal gastric mucosa samples. Conversely, miR-122-5p expression levels were significantly higher in the AFPGC tissue samples compared with the normal gastric mucosa and the non-AFPGC tissue samples (Figure 2A). The plasma expression levels of miR-122-5p were also significantly higher in the AFPGC patient samples than the samples from health volunteers and the non-AFPGC patients (Figure 2B). Figure 2 Quantification of miR-122-5p expression levels by quantitative reverse transcription-polymerase chain reaction. A: Comparison of miR-122-5p expression levels between normal gastric mucosa, non-alpha-fetoprotein-producing gastric cancer (AFPGC) and AFPGC in tissue samples. aP < 0.05, compared to normal gastric mucosa; bP < 0.05, compared to non-AFPGC; B: Comparison of miR-122-5p expression levels between health volunteers, non-AFPGC and AFPGC in plasma sample. aP < 0.05, compared to health volunteers; bP < 0.05, compared to non-AFPGC. The lines inside the bow plot represent the average size. We next investigated the relationship between plasma AFP levels and plasma miR-122-5p expression levels in the AFPGC and non-AFPGC patients and found that miR-122-5p expression level in plasma was strongly correlated with plasma AFP level (r = 0.7975, P < 0.0001; Figure 3). Figure 3 Relationship between plasma alpha-fetoprotein levels and plasma miR-122-5p expression levels. Plasma miR-122-5p expression level was strongly correlated with plasma alpha-fetoprotein (AFP) levels in gastric cancer patients (r = 0.7975, P < 0.0001). 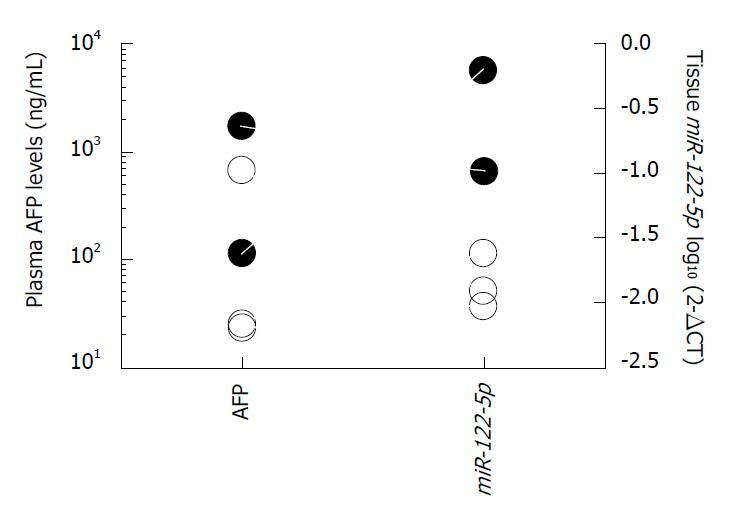 Figure 4 shows the correlation between malignant potential, all biomarkers, tissue miR-122-5p expression, and plasma AFP level in the AFPGC patients. We found that the expression level of miR-122-5p in tissue exhibited a stronger correlation with malignant potential (i.e., liver metastasis) than plasma AFP level in the AFPGC patients. Two patients with malignant potential were diagnosed morphologically as poorly differentiated adenocarcinoma and mucinous adenocarcinoma, and the other current alive patients were diagnosed as poorly differentiated adenocarcinoma and hepatoid adenocarcinoma. 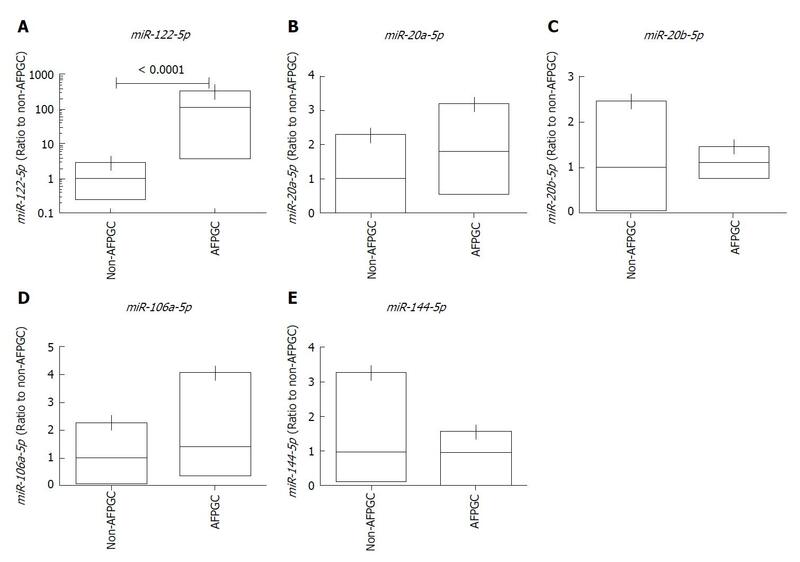 Figure 4 Correlation between malignant potential and tissue miR-122-5p expression levels in alpha-fetoprotein-producing gastric cancer patients. White symbols indicate current alive and black symbols indicate current death. AFP: Alpha-fetoprotein. AFPGC has been reported to be more likely to metastasize to liver and is therefore associated with extremely poor prognosis[8,11]. However, no genomic analyses have been conducted for AFPGC due to its rarity. Therefore, AFPGC-specific genomic and/or epigenomic alterations are not well known, which have urged us to examine the molecular characteristics specific to AFPGC. The current study investigated the molecular characteristics of AFPGC with a comprehensive analysis, with particular focus on miRNA expression. The findings of the present study clearly demonstrated that the expression of miR-122-5p was significantly higher in the AFPGC tissues than the normal and non-AFPGC tissues. The expression levels of this miRNA were also higher in the plasma samples of patients with AFPGC compared with those of healthy volunteers and non-AFPGC patients and correlated with plasma AFP levels to a certain extent. Interestingly, the tissue expression level of miR-122-5p exhibited a stronger correlation with malignant potential than plasma AFP level in AFPGC patients, suggesting that miR-122-5p might have utility as a prognostic biomarker especially for liver metastasis in this small GC subgroup. miR-122-5p expression has been increasingly examined in various normal and cancer tissue types. Several studies reported that miR-122-5p was specifically expressed in human liver and that hepatocyte-specific miR-122-5p regulated hepatocyte differentiation and metabolism[21-23]. Taken together, AFPGC might show characteristics of hepatocytes not only morphologically but also in its miRNA expression patterns. In fact, AFPGC was not necessarily hepatoid adenocarcinoma in this series, and two patients with aggressive development of liver metastasis were diagnosed morphologically as poorly differentiated adenocarcinoma and mucinous adenocarcinoma. Conversely, miR-122-5p was previously shown to function as a tumor suppressor and was reported to be downregulated in several cancer types such as hepatocellular carcinoma, non-small-cell lung cancer, gallbladder carcinoma, bladder cancer, and breast cancer. In GC, the expression of miR-122-5p was reported to be lower in tumor tissue than the adjacent non-cancerous tissue. Furthermore, several studies reported that miR-122-5p inhibited proliferation, migration, and invasion in GC[15,29,30]. It’s not known exactly why miR-122-5p, which is known as suppressor gene, is higher in AFPGC. Some miRNA was reported that decreased in early cases and elevated again in staged-advanced cases. Therefore, miR-122-5p decreased in carcinogenesis might be elevated during tumor evolution to AFPGC. However, the exact mechanism is unknown at the present time. In the current study, we did not see a correlation between miR-122-5p in patients with non-AFPGC and development of liver metastasis, suggesting that the mechanism underlying liver metastasis might be distinct between AFPGC and non-AFPGC. We assume that AFPGC is completely different from non-AFPGC, and the mechanism of liver metastasis between AFPGC and non-AFPGC is also distinct. Several reports demonstrated that the clinical behavior of AFPGC was distinct from that of non-AFPGC. Recently, Lu et al demonstrated that AFP contributed to invasion and metastasis directly. We speculate AFPGC has specific ability of liver metastasis, and correlated with miR-122-5p. Therefore, miR-122-5p might directly facilitate tumor proliferation, migration, and invasion, which raises the possibility of miR-122-5p as a potential therapeutic target in AFPGC. However, future studies are warranted to demonstrate the biological function underlying altered expression of miR-122-5p in AFPGC. The current study revealed miR-122-5p as a potentially useful biomarker for early detection, disease monitoring, and prognostic prediction in patients with AFPGC, which warrant further investigation. Alpha-fetoprotein (AFP)-producing gastric cancer (AFPGC) is recognized as one of the most aggressive tumors, with a high propensity for liver metastasis and subsequent poor prognosis compared with other GC subtypes. Recent comprehensive molecular analyses have not yet referred to this minor subtype because of its rareness. To discover universal biomarkers for liver metastasis by researching AFPGC-specific microRNAs (miRNAs). To investigate the clinical utility of AFPGC-specific miRNA for monitoring and prognostic prediction of patients. We performed a comprehensive miRNA array-based approach to compare miRNA expression levels between AFP-positive and AFP-negative cells, and also investigated the clinical utility of the identified AFPGC-specific miRNAs. We found the expression of miR-122-5p was significantly higher in the AFPGC tissues than the normal and non-AFPGC tissues. The expression levels of this miRNA were also higher in the plasma samples of patients with AFPGC compared with those of healthy volunteers and non-AFPGC patients and correlated with plasma AFP levels. Moreover, the tissue expression level of miR-122-5p exhibited a stronger correlation with malignant potential than plasma AFP level in AFPGC patients. miR-122-5p as a potentially useful biomarker for early detection and disease monitoring in patients with AFPGC. We identified miR-122-5p as AFPGC-specific miRNA. miR-122-5p might be a clinical useful biomarker in AFPGC. Although studies are warranted to demonstrate the biological function underlying altered expression of miR-122-5p in AFPGC, the miR-122-5p might be a potential therapeutic target for liver metastasis in AFPGC. The Authors are grateful to Motoko Inui and Makiko Mishina for expert technical assistance.